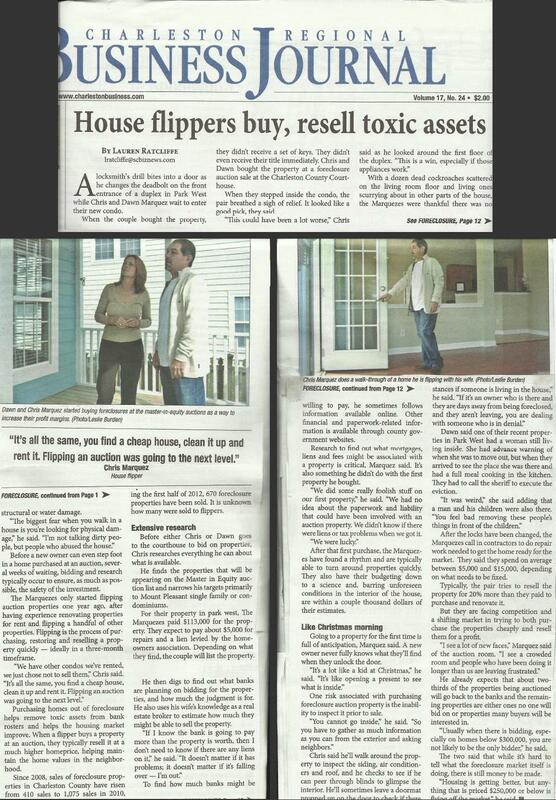 Home > Company > Charleston Business Journal ~ "House Flippers Buy, Resell Toxic Assets"
COVER STORY: "House Flippers Buy, Resell Toxic Assets"
"House Flippers Buy, Resell Toxic Assets"
A locksmith’s drill bites into a door as he changes the deadbolt on the front entrance of a duplex in Park West while Chris and Dawn Marquez wait to enter their new condo. Purchasing homes out of foreclosure helps remove the toxic assets from the bank roster and helps the housing market improve. When a flipper buys a property at auction, they typically resell it at a much higher home price, helping maintain the home values in the neighborhood. Since 2008, sales of foreclosure properties in Charleston County have risen from 410 sales to 1,075 sales in 2010. During the first half of 2012, 670 foreclosure properties have been sold. It is unknown how many have been sold to flippers. Before either Chris or Dawn goes to the courthouse to bid on properties Chris researches everything he can about what is available. He finds the properties that will be appearing on the Master in Equity auction list and narrows his targets primarily to Mount Pleasant single family or condominiums. For their property in Park West, the Marquezes paid $113,000 for the property. They expect to pay about $5,000 for repairs and a lien levied by the homeowners association. Depending on what they find, the couple will list the property. He then digs to find out what banks are planning on bidding for the properties, and how much the judgment is for. He also uses his wife’s knowledge as a real estate broker to estimate how much they might be able to sell the property. “If I know the bank is going to pay more than the property is worth, then I don’t need to know if there are any liens on it,” he said. “It doesn’t matter if it has problems, it doesn’t matter if it falling over – I’m out.” To find how much banks might be willing to pay, he sometimes follows information available online. Other financial and paperwork-related information is available through county government websites. After that first purchase, the Marquezes have found a rhythm and are typically able to turn around properties quickly. They also have their budgeting down to a science and barring unforeseen conditions in the interior of the house, are within a couple thousand dollars of their estimates. After the locks have been changed, the Marquezes call in contractors to do the repair work needed in order to get the home ready for the market. They said they spend average of between $5,000 and $15,000 depending on what needs to be fixed. Typically, the pair tries to resell the property for 20% more than they paid to purchase and renovate it. But they are facing competition and a shifting market in trying to both purchase the properties cheaply and resell them for a profit. “I see a lot of new faces,” Marquez said of the auction room. “I see a crowded room and people who have been doing it longer than use are leaving frustrated.” He already expects that about two-thirds of the properties being auctioned will go back to the banks and the remaining properties are either ones that no one will bid on or properties many buyers will be interested in. “Usually when there is bidding especially on the homes below $300,000 you are not likely to be the only bidder,” he said. The two said that while it’s hard to tell what the foreclosure market itself is doing there’s still money to be made. “Housing is getting better, but anything priced $250,000 or below is flying off the market,” he said. For more information and photos, visit www.charlestonbusiness.com.